19 Super Chic Outdoor Planters That Will Make your Plants Look Beautiful! 19 Super Chic Outdoor Planters That Will Make your Plants Look Beautiful Than Ever! Home » OUTDOOR » 19 Super Chic Outdoor Planters That Will Make your Plants Look Beautiful Than Ever! Garden decorating or yard landscaping has reached next level awesomeness when it comes to working up the plants, displaying amazing florals or placing pretty planters around the space. Turn your yard or front porch into a complete glory with these super chic outdoor planters. Who doesn’t love a little bit of green at that empty corner of their Patio or that wooden deck that you were thinking about to pop up with some colors. These pleasing DIY cinder block planters will not only fill your eyes with glare but will also add that minimalistic urban cool look to your home. You can start with a couple of cinder blocks and arrange them in any shape that fills out the empty space. Fill them with succulents as they require less water but nothing is stopping you from adding that nice bright tint of red to that dull brown wooden patio. They are really easy to make and require least of your time. You can choose between small plant pots that fit nice and snug inside the cinder blocks or the wire mesh and landscape fabric method mentioned in the link below. This unique 3 feet tall wooden planter will surely gives your entrance that uber luxe look. It is easy to DIY and the best part is that you can always stain the wooden with a tint of your choice. All you will need is supplies worth 50 dollars and you are all set to work upon this beauty. You can DIY a pair and place them next to your fire place, main entrance or patio. No matter where you keep these amazing planters, they are destined to woo anyone who looks at them. The overall build process requires some basic tools knowledge but it’ll be worth it when you are done. Visit the link below for the whole detailed process on how to create these beautiful wooden planters and glam up your patio. Why limit yourself to the shades of green or to those of much clichÈd flowers. These DIY painted cinder block planters takes the decor game to the next level. They start out with normal cinder blocks aligned accordingly inheriting the plastic pots or the usual wire mesh and landscape fabric setup for plants. You can use painters tape and acrylic color to paint colorful stripes on the cinder blocks. You can use colors and shape of your choice to enhance that otherwise pale green garden. Cardboard cutouts and alphabets can also be used to add some unique variety. These planter will not only fill up all that empty areas but also add that countryside look that everyone loves. You can start by following the detailed method explained in the link below. These DIY planters looks so good that you might not want to share the idea with your over envious neighbors. They are really easy to make and looks nothing like those regular planters. The process to create one requires a little knowledge of basic tools but it will be worth as they will steal every single gaze. The process requires the construction of the inverted wooden tall pyramid with a flat base equipped with a square plastic planter on top that will hold the soil and also protects the wood from decaying. These tall planters will add that never seen before look to your wooden deck. All you need is some lumber, wood glue, nails, hammer and 20 dollars to start constructing one. Also, don’t forget to check the link below for instructions on how to construct a $20 tall planter. All you need is a couple of hours and a little bit of arm movement and your patio can be restored to the foremost glory. These half wood half paver planter box will not only be a great addition to your decor but will also add some color to it. At first, it might seem like a hard job but once you get on with it, it’s just a walk around the corner. You can place them at the most visible area of your patio and use them to showcase your house number or whatever you desire to add vibrance to your home. They will append that essential rustic look to your patio or deck in no time. For this you will need some pressure treated wood, five pavers, some 3 inch screws and a strong will. Visit the link below for the detailed instructions. These tapered cedar wood planters will make the most of even the most boring wooden patio or deck. All you need is some cedar lumber and build a 22 inches tall inverted pyramid with a flat bottom. Add on a small square plastic planter and voila! You are done! These intentionally small planters can add a charming vibe next to the doors, patio stairs and even indoors with some succulents. They can also be stained for a seamless merger with the decor. You can choose some bright plants to add that extra always desired color to your home. The build process is really simple and require basic tools combined with 10 dollar worth material. You can also follow the link given below for detailed plans and directions on how to make the tapered cedar planters of your own. These metal drawer planters will add an interesting rustic feel to your monotonous looking patio or that dull wooden deck. All you need is some old metal drawers and combine them with a rectangular plastic planter. Interestingly, you can buy new metal drawers, further grabbing a sand paper and turning them into a weathered looking planter that is going bring that countryside vibe to your furnishing. Place them next to the main entrance and they will grab every look that passes by them. Or simply, make them part of your already existing planters and add some variety. Flowers and colorful plants go best with the unfurnished look of these planters that aren’t just easily available, but are equally easy to place. Here’s a stunning set of french flower pots that are relatively easy to make and will surely prove to be a great addition to the garden. But what makes them unique is that french touch layered over them. They can be placed in your garden, next to the stair way or simply can used to fill empty areas around the patio. You can replace your entire terra cotta plants pots with these custom french flower pots without any doubt. They will instantly connect with your minimalist decor and enhance it with that french quintessence. 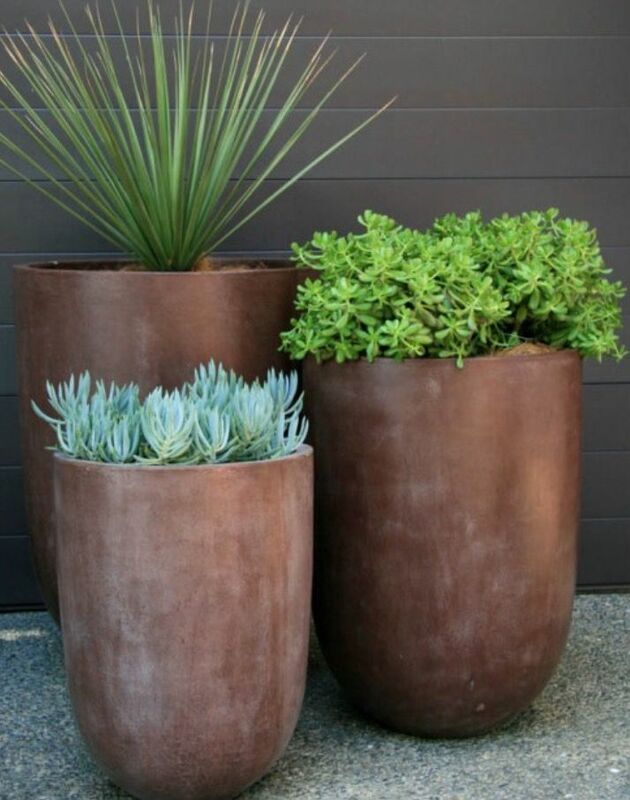 You can start with plain terra cotta pots or can choose a color that suits your outer furbishing. You can find the detailed instructions in the below mentioned link. The most amazing thing about wooden pallet decor is that it comes for an inexpensive deal and looks as glorious as any store-bought alternative to the same. All you are going to need to whip up the pallet goodness is of course, some pallet wood, a miter saw, a hammer, some nails, and some wooden boards in dimensions specified in this wonderful tutorial shared by Live Laugh Rowe. Speaking of the steps, it’s all about arranging the different pieces in a particular fashion and connecting them to one another with the help of nails. Finally, you get that weathered texture by performing a clever paint job using some black crafting paint and a piece of rag to sand the surface with. You’ll love how the original texture of the wood complements the parts that have been splashed with paint. While everyone goes for bricks, concretes and terra cotta to work up planters at home, this one comes like a breath of absolute fresh air. Because this time, you build the planters with the rustic metallic beauty of copper. Oh yes, it doesn’t actually have to be metal when it comes to constructing the planters, the key here is to coat the surface of a regular one with a copper spray paint, and you get that element of luxury almost instantly. Perfect for decorating the front porch or simply placing inside the room as beautiful accents, the planters would look best when assembled together in varied heights and sizes. You can even go vivid with the plants installed in each of the pots, just like this inspiration shared by Pin Img. 20 Adorable Outdoor Playhouse Ideas for Kids That Are No Less Than a Miniature Dreamland! 13 Uber Cool Outdoor Pallet Furniture Ideas Making Your Yard Cozy and Pretty! Make the Most of a Limited Space with these 19 Fabulous Small Patio and Balcony Ideas!